Nutrisource® Fiber Powder provides 3 grams of soluble fiber per 1 tablespoon serving from 100% PHGG (partially hydrolyzed guar gum). The Institute of Medicine's recommended intake for total fiber for adults 50 and younger is set at 38 grams for men and 25 grams for women, while for men and women over 50 it is 30 and 21 grams per day, respectively, due to decreased food consumption. 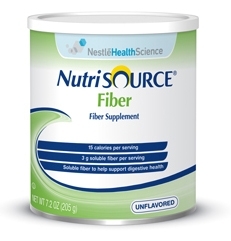 Nutrisource® Fiber provides nutritional support for bowel function and digestive health. It provides soluble fiber to help support digestive health and normal bowel function*. Will not compromise taste of texture of foods or beverages. Can be added to juice, milkshakes, pudding, gravy, soup, sauces, or casseroles. THIS PRODUCT IS APPROPRIATE FOR USE IN INDIVIDUALS GREATER THAN 3 YEARS OLD. Appropriate for lactose-free, gluten-free, and kosher. Oral Feeding Administration: Stir 1 tablespoon (4 g) or 1 packet into at least 4 oz of any hot or cold beverage or prepared soft food, including purees. Tube Feeding Administration: Add 1 Tablespoon (4 g) or 1 packet NUTRISOURCE® FIBER Powder to 2–4 fl oz (60-120 mL) water. Mix and administer by syringe through feeding tube. Flush afterwards with a minimum of 1-2 fl oz (30-60 mL) water.